Welcome to the Rosenzweig Group! 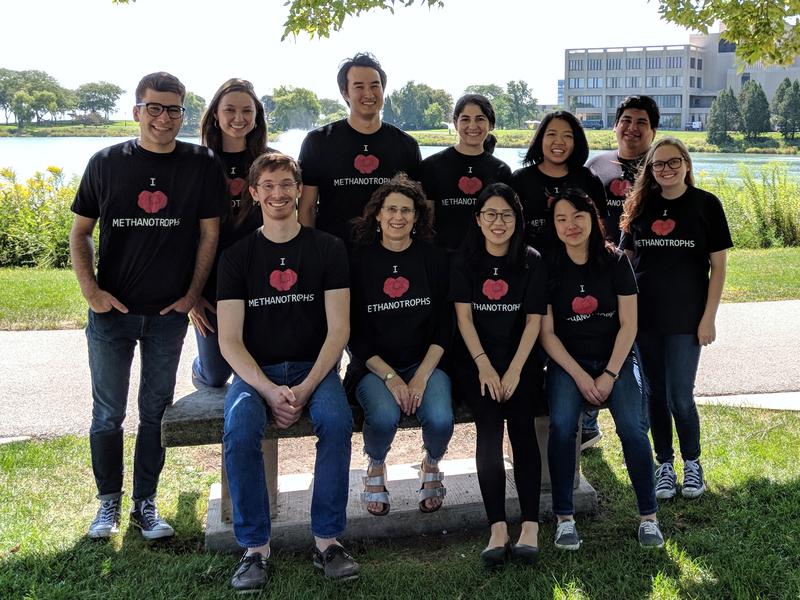 The Rosenzweig group is focused on understanding metalloprotein function on the molecular level. 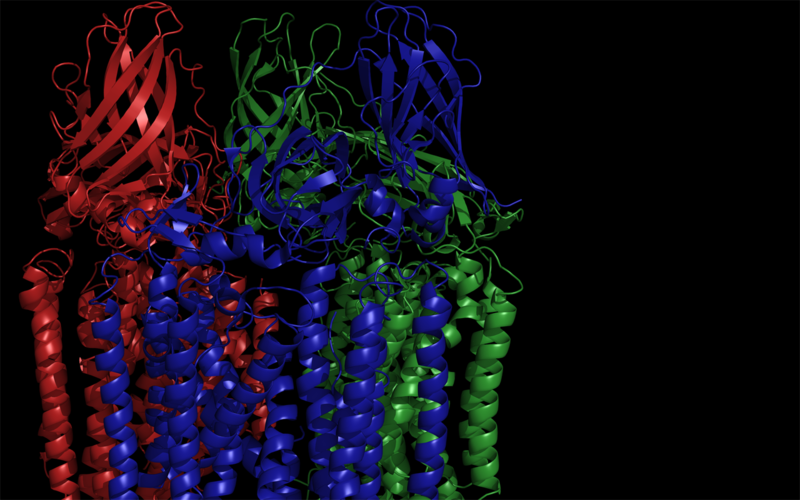 We use X-ray crystallographic, spectroscopic, biochemical, genetic, and bioinformatic approaches to attack problems at the forefront of bioinorganic chemistry. Specific areas of interest include biological methane oxidation, oxygen activation by metalloenzymes, metal uptake and transport, and natural products biosynthesis. We are in the Department of Molecular Biosciences at Northwestern University (Evanston campus). We are also part of the Department of Chemistry. Tasha Manesis has joined the group as a postdoctoral fellow. Tasha received her Ph. D. from Ohio State working with Prof. Hannah Shafaat. Matt and Oriana's paper on the PmoD CuA site is published in J. Am. Chem. Soc. Read the article. Three new Chemistry students have joined the group. Welcome Ricky Jodts, Gerri Roberts, and Madison Sendzik! Oriana, Grace, Matt, and Soo's paper on PmoD is published in Nat. Commun. Read the article. Yue Wen and Soo's paper on XoxF is published in J. Biol. Inorg. Chem. Read the article. Grace has left the group for a postdoctoral position at Harvard. Good luck Grace! Soo's paper on reconstitution of pMMO into bicelles is published in J. Biol. Chem. Read the article. Yun Ji and Grace's paper on the aminotransferase MbnN is published in Biochemistry. Read the article. Grace's review on chalkophores is published in Annu. Rev. Biochem. Read the article. Soo's protocol on genetic manipulation of methanotrophs is published in Methods Enzymol. Read the article. Grace's paper on methanobactin biosynthesis is published in Science. Read the article. This work was also featured in C&E News and on the Northwestern website. Rahul's paper on CopB is published in Proc. Natl. Acad. USA Read the article. Grace's minireview on methanobactins is published in J. Biol. Chem. Read the article. Our collaborative paper with the Ryde group is published in Angew. Chem. Int. Ed. Read the article. Amy's perspective on LipA is published in Science. Read the article. Grace has defended. Congratulations Grace! Rahul has left the group for a postdoctoral position at Caltech. Good luck Rahul! Congratulations to our graduating seniors Yue Wen, Candy, and Beth! Amy was elected to the National Academy of Sciences! Laura has accepted a faculty position at Stanford. Congratulations Laura! 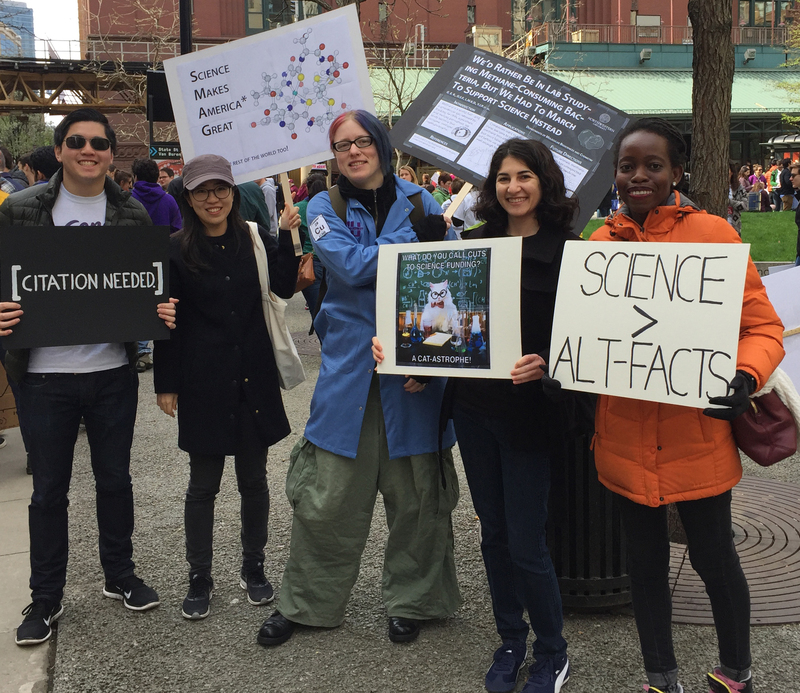 Members of the group march for science. Yun Ji Park has joined the group as a postdoctoral fellow. Yun Ji received her Ph. D. from UIUC working with Prof. Alison Fout. Aaron and Matt's paper on the P1B-4 ATPase CzcP is published in Biochemistry. Read the article. Laura and Grace's review on methanobactins is published in Metallomics. Read the article. Matt and Amy's review on MMOs is published in J. Biol. Inorg. Chem. Read the article. Laura, Grace, and Soo's paper on methanobactin transport is published in Proc. Natl. Acad. Sci. USA. Read the article. Tom and Amy's review is published in Curr. Op. Chem. Biol. Read the article. Our collaborative paper with the Hoffman group is published in JACS. Read the article. Grace's characterization of a new methanobactin is published in JACS. Read the article. Tom has left the group to join the Johns Hopkins Applied Physics Laboratory. Congratulations and good luck! Tom and Amy's Perspective on methane-oxidizing enzymes is published in JACS. Read the article. Aaron has left the group to join the Dept. of Chemistry and Biochemistry at University of Maryland, Baltimore County. Congratulations and good luck! Chris Koo has joined the group. Welcome Chris! Our collaborative paper with LLNL is published in Nat. Commun. Read the article. Tom and Amy's Perspective on MCR is published in Science. Read the article. Grace and Monica's paper on copper-responsive gene regulation in Ms. trichosporium OB3b is published in Metallomics. Read the article. Laura is profiled by Northwestern. Read the article. Tom, Grace, and Joe's paper on CopC is published in Biochemistry. Read the article. Our collaborative paper with the Statsyuk group is published in JACS. Read the article. Our collaborative paper with the Jewett group is published in Biotechnol. J. Read the article. Aaron's article on a novel metal binding domain from a P1B-4-ATPase is published in Nature Chem Biol. Read the article. Oriana Fisher has joined the group as a postdoctoral fellow. Oriana received her Ph. D. from Yale working with Prof. Titus Boggon. Congratulations to our graduating seniors Joe, Monica, Caleb, and Madeline! Matt Ross has officially joined the group. Welcome Matt! Laura received a Postdoctoral Enrichment Program grant from the Burroughs Wellcome Fund. Congratulations! Sarah's Current Topic article is published in Biochemistry. Read the article. Laura was featured in an ASBMB Research Spotlight article! Amy's News & Views commentary on sMMO is published in Nature. Read the article. Aaron, Grace, and Joe presented their research at the Bioinorganic Chemistry GRS chaired by Tom. Sarah has left us for a position at Abbott Laboratories. Congratulations and good luck! Joe received a Fletcher Prize for Undergraduate Research for work he did with Tom. Congratulations! Ingrid has left us for a position at the Heinrich-Heine-Univerisät Düsseldorf. Congratulations and good luck! Amy was inducted into the American Academy of Arts and Sciences. Amy received the Ivano Bertini Award at the Ninth International Copper Meeting. Congratulations! Grace received the Rappaport Award for Research Excellence. Congratulations! Rahul Purohit has joined the group as a postdoctoral researcher. Rahul received his PhD in chemistry for work done in the lab of Dr. William Montfort at the University of Arizona. Megen's paper on the structure of methanol dehydrogenase is published in Biochemistry. Read the article. Sarah successfully defended her PhD thesis. Congratulations! Soo Ro has joined the group as a graduate student. Soo obtained her undergraduate degree in integrative biology from the University of California, Berkeley. Megen's paper on EPR studies of pMMO metal centers is published in JACS. Read the article. Megen has left us to become an Assistant Professor at Appalachian State University.. Congratulations and good luck! Sarah's paper on the effects of zinc on pMMO is published in the Journal of Biological Chemistry. Read the article. Amy received the Royal Society of Chemistry Joseph Chatt Award. Amy was elected to the American Academy of Arts and Sciences. Aaron's article on the diversity of metal-transporting ATPases is published in the Journal of Biological Inorganic Chemistry. Read the article. Tom's article on conservation of the B subunit in particulate methane/ammonia monooxygenases is published in Proteins: Structure, Function, and Bioinformatics. Read the article. Eliza's article on a nickel- and iron-transporting P1B-type ATPase is published in Metallomics. Read the article. Eliza has left us to take up a postdoctoral research position at Argonne National Laboratory. Good luck! Laura Dassama joined the group as a postdoctoral fellow. Laura comes from the joint lab of Profs. Carsten Krebs and J. Martin Bollinger Jr. at Penn. State. Laura and Amie's article on class 1c ribonucleotide reductases is published in Biochemistry. Read the article. Amie has left us to become an Assistant Professor at Penn State. Congratulations and good luck! Tom's article on a nitrite reductase involved in nitrifier denitrification is published in the Journal of Biological Chemistry. Read the article. Tom successfully defended his PhD thesis. Congratulations! Eliza successfully defended her PhD thesis. Congratulations! Amy was invested as the Weinberg Family Distinguished Professor of Life Sciences. Amy's News and Views article on soluble methane monooxygenase is published in Nature Chemical Biology. Read the article. Grace's paper on detection of new methanobactins in genomes is published in BMC Biology. Read the article. Tom Lawton was elected Chair of the 2015 Bioinorganic Chemistry Graduate Research Seminar. Rosenzweig lab alums Raquel Lieberman (Georgia Tech), Matt Sazinsky (Pomona College), and Liliya Yatsunyk (Swarthmore College) were all promoted to Associate Professor with tenure. Congratulations!